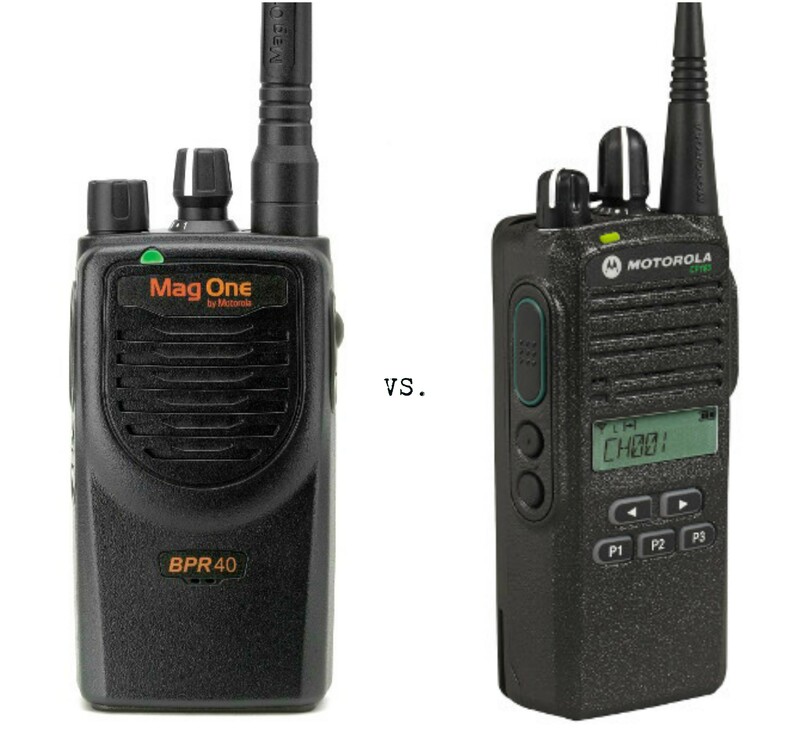 CP185 vs. Mag One BPR40 – What Is The Best Two Way Radio For You? In industries such as education, retail, warehousing, health care, hospitality and property management, communication among employees and colleagues is just as important as more rugged work environments for both safety and productivity. Access to a device that is reliable, durable and efficient is important, and Motorola two way radios check all those boxes. So let’s take a look at two common two way radios used in those industries, compare them, and help you make a decision on which one might better suit your team – the CP185 vs. the Mag One BPR40. Noisy work environments are no match for this Motorola two way radio – built with X-Pand technology to provide crisp, clear audio. A great communication tool in the workplaces listed above, the CP185 provides enhanced communication abilities and, therefore, increased productivity. Battery Life – This depends, like with all two way radios, on the battery you choose to use with the CP185. The standard battery life with this product is 10 hours, but there are options for prolonging battery life. Audio – As mentioned above, the CP185 comes complete with Motorola’s X-Pand Technology – built for noisy workplaces to provide clear and crisp audios to its users. Size and Weight – Known for being a small and lightweight two way radio, this compact product comes in at under a pound. This makes it comfortable to be worn throughout the day – however you choose to do so. Durability – Motorola wouldn’t give a two way radio a two-year warranty if they didn’t think it was durable. The CP185, like all Motorola two way radios, has been put through a series of testing to ensure it can hold up to the environment’s it’s meant to be used in. Also, with an IP54 rating (a two-digit number system that determines how well the electronics keep out environmental factors that can damage it’s inside), you know you’re purchasing a durable product. Temperature Rating – Operating temperature between -30C and +60. 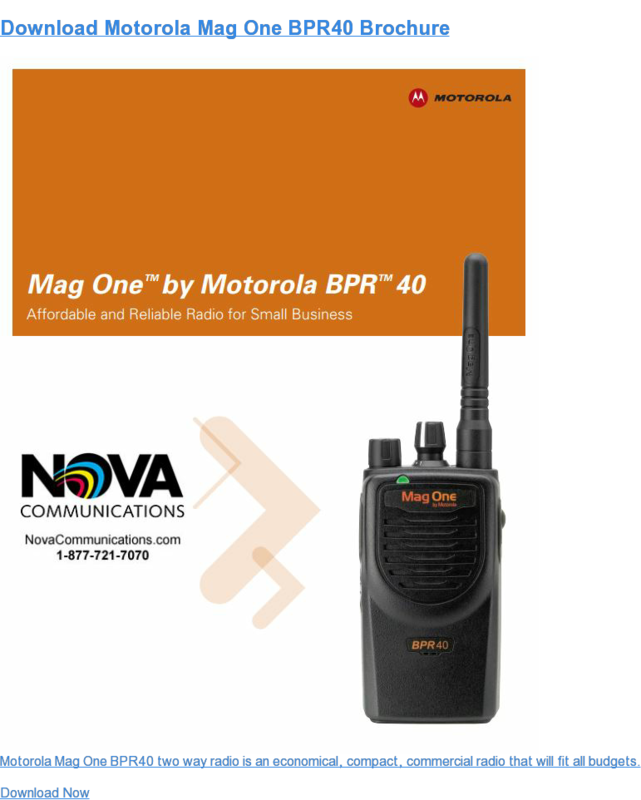 Known to be a little radio with big features, the Mag One BPR40 is a great Motorola two way radio option for the industries above. Designed and ideal for an affordably priced option, the Mag One features two programmable buttons for easy access to frequently used features. Battery Life – The standard battery with the Mag One BPR40 has an eight hour battery life, but battery upgrades can add a bit more time to that length. Audio – The BPR40 does not boast any noise canceling features but, even without added features, has good sound quality for its users. Size and Weight – Small in size and lightweight at just over half a pound, this two way radio is meant to be worn (and comfortably) throughout the work day. Durability – Unfortunately, the BPR40 is not IP certified, but as already mentioned above, if it’s made by Motorola, it is made to be durable in your work environment. This two way radio comes with a one year warranty. Temperature Rating – The temperature range of the BPR40 is -30C to +60C for the radio only. We think, when considering the industries mentioned above, that the CP185 ticks a few more boxes when it comes to the features our customers want in a two way radio. Whether you’re working in any of the environments above or others, the team at Nova Communications has the knowledge to help you with your Motorola two way radio needs. Contact us today for more information on the radios above, or newer radios that would suit your industry. We’re here to help! Want to find out more about the products you’ve just read about? Click on the brochures below!